How can I find my way around once I get here? Am I required to bow, kneel, or cross myself? Can I hold my wedding at St. Stephen’s? Can I baptize my child at St. Stephen’s? Can I hold a funeral at St. Stephen’s? 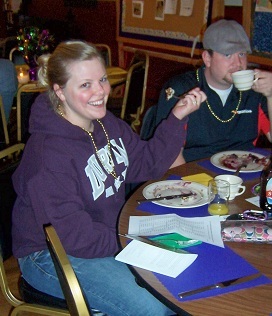 How can I meet people and get involved? How can I receive pastoral care? How can I receive prayer support? What if I have a great idea for the church? We are located at 215 North 7th Street in Terre Haute, Indiana—across the street from Indiana State University. Look for a gray limestone building with a copper-clad steeple, the center church in a row of three churches. Eagle Street is to our north, Larry Bird Avenue to our south, and our main entrance is through a formal garden just off 7th street. (There is a sign on the building, but it’s not very big.) Click here to see a map of our location. Call our church office at 812-232-5165 or click here to send an email. Better yet, come visit us on Sunday—and be sure to stay for coffee and donuts! 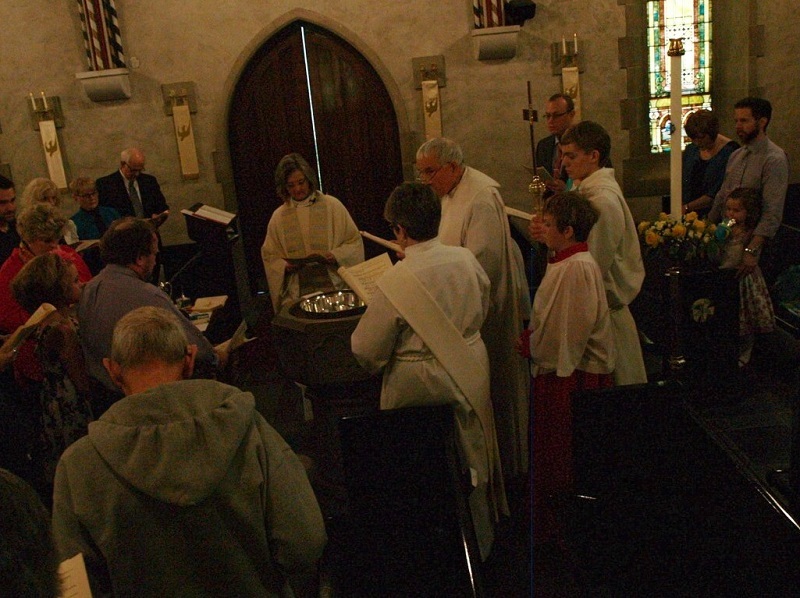 Services are celebrated every Sunday at 8:00 and 10:00 a.m. and Thursday at 12 noon during most of the year. 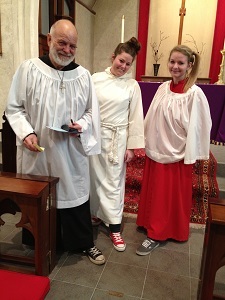 During the summer, we also enjoy an Evening Prayer/Holy Communion service at 6 p.m. on 1st and 3rd Sundays in the month. 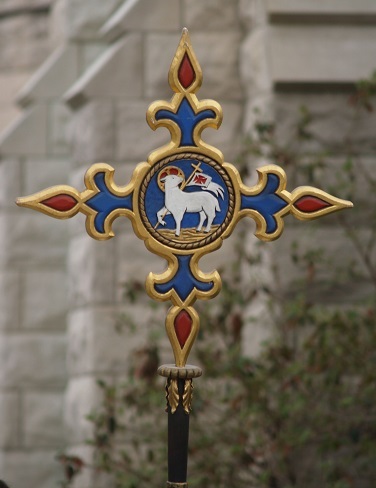 Please check the parish calendar and the What’s New? section of this site for any changes to the normal schedule. Click here for a more detailed description of our services. 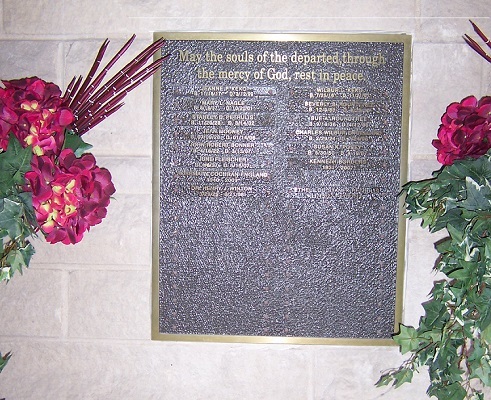 Both Sunday services are held in the main sanctuary, which is to `left as you enter the garden from 7th Street. The Thursday Eucharist service is conducted without music and held in the chapel, which is to your right as you enter the garden. The 6 p.m. services in summer are held in the garden—bring a lawn chair!—or in the chapel, depending on the weather. No! You’re welcome as you are! 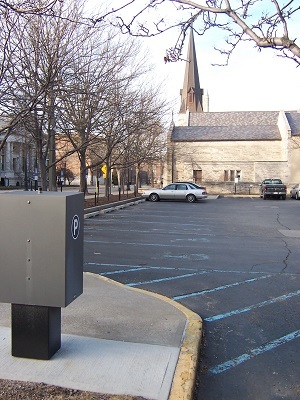 The most convenient parking area for Sunday mornings is the metered lot just south of St. Stephen’s. It is not necessary to pay on Sunday, and the handicapped slots may be used by anyone on Sunday without penalty. Additionally, parking is permitted in the ISU lot on Eagle street behind Centenary United Methodist Church (to our north), and limited street parking is available on Eagle Street (to our north) and Larry Bird Avenue (to the south). During the week, the metered lot requires payment and is time limited–payment is accepted at a kiosk at the corner of Larry Bird Avenue and 7th Street. A large parking garage at 8th and Cherry is within easy walking distance, and the downtown parking garage on Wabash Avenue between 6th and 7th Streets is easily walkable as well. Click here to see a map of our location. Corner of 7th and Eagle Streets. Garden as viewed from 7th Street. When you enter the garden from 7th Street, the main entrance to the church is to your left. 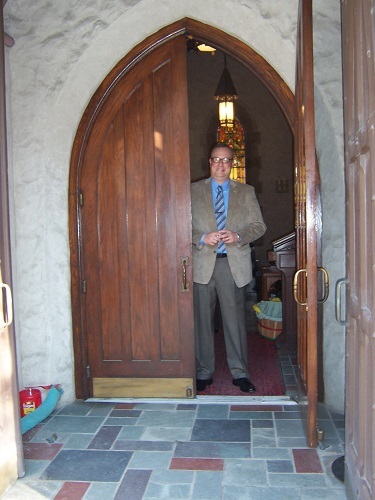 Most of us enter this arched set of doors when we come for Sunday worship. Straight ahead, through the covered cloister door, is a hallway that leads to our Great Hall (parish hall). 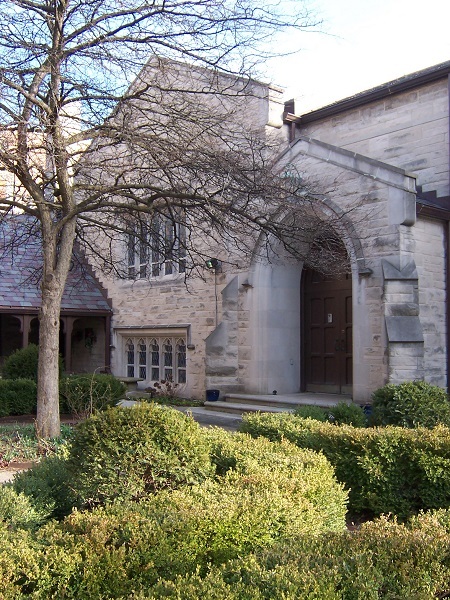 To the right, behind the central tree, is a set of double doors that leads to the chapel and office annex. Around the corner, in the bell tower, is another door to access the sanctuary. A little further along Eagle Street is a door that accesses the north end of the Great Hall. You can click here to access a floor plan for our facility. And don’t hesitate to ask any one of us for directions. We’re happy you’re here and happy to help. There is a handicapped accessible restroom at the north end of the Great Hall (next to the small bookcase) and more restrooms right inside the Eagle Street entrance to the Great Hall, also on the north end. More restrooms are available in the office wing. 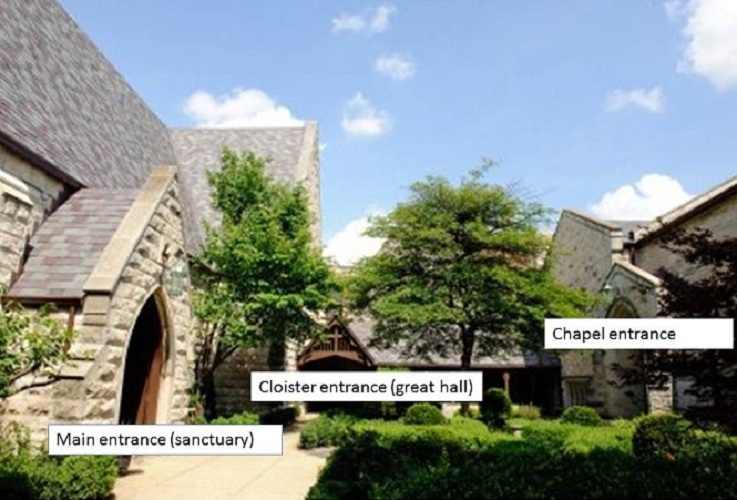 Any parishioner will be glad to direct you—or click here to access a floor plan of the church. The restrooms are marked in red! Mostly! All but the educational/office wing is accessible at this time. The parking lot immediately south of us offers wheelchair access to the building. The main sanctuary and Great Hall can be accessed through the cloister door, directly ahead as you enter the building. 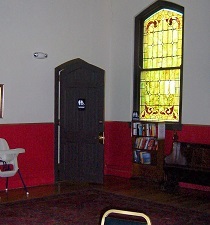 The restroom at the north end of the Great Hall (down the small hallway from the door and to your left, across the room) is wheelchair accessible. We do not currently have a staffed nursery during our worship services. However, we welcome babies and children in the service, and a little fussing doesn’t faze us. 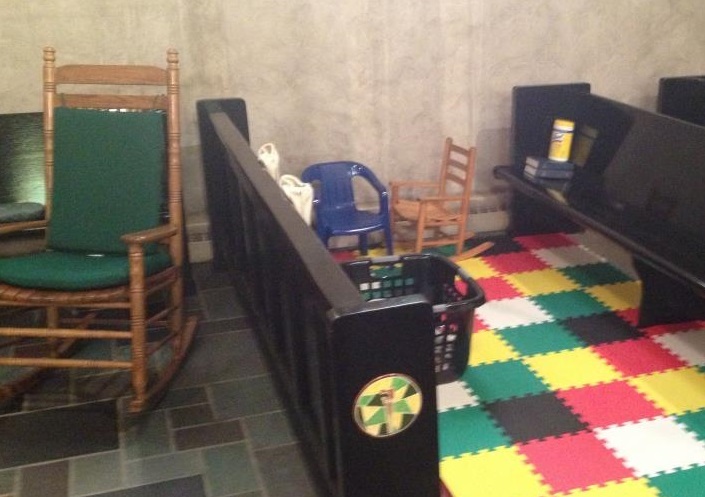 We even have a special section for little ones at the front right of the sanctuary with padded floors and a rocking chair. We also have little bags available with crayons and books to keep children occupied and a toy-equipped room just outside the worship space where you can feed or change babies and let children stretch their legs or play with toys while still listening to the service. The accessible restroom in the Great Hall has a pull-down changing table. Our ushers will be happy to help you access these resources. If you have school-age children or teens, be sure and check out our Christian Discovery programs. We really hope you’ll join us for worship. You can click here for a description of what you can expect. But don’t worry too much about knowing what to do. Any of us will be happy to help you! No. These gestures are completely optional. Some of us find them deeply meaningful, but many others do not do them at all. (Note: If you notice that the people behind you are kneeling, it’s considerate to lean forward or move toward the front of your seat to give them room.) Click here for helpful information about these traditional gestures, what they mean, and how they are typically used in a service. The parish office is open Tuesday to Friday in the afternoons. Telephone is 812-232-5165. 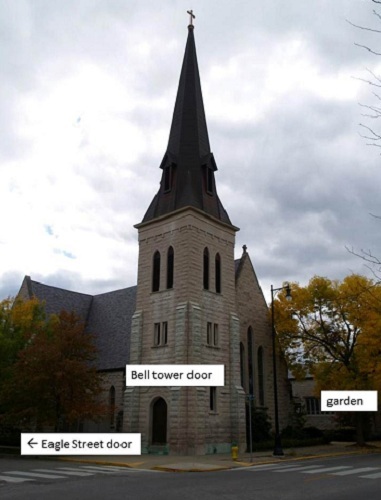 The building is normally locked during the week for safety reasons, but you can contact the office through an intercom located next to the chapel doors—to the right as you enter the garden from 7th Street. It’s usually helpful to call before coming to make sure someone is there to greet you. Click here to send an email—we’ll get back to you as quickly as we can! If you have an established relationship with St. Stephen’s, probably. If not, maybe. In any case, let’s talk. Call the church at 812-232-5165 or click here to email the interim rector. For more information about how we approach weddings, click here. If you have an established relationship with St. Stephen’s, probably. If not, maybe. In any case, let’s talk. Call the church office at 812-232-5165 or click here to email the interim rector. For more information about how we approach baptism, click here. If you have an established relationship with St. Stephen’s, probably. If not, maybe. In any case, let’s talk. 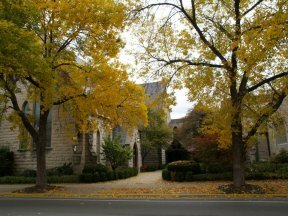 Call the church at 812-232-5165 or click here to email the interim rector. For more information about how we approach funerals, click here. That’s easy. Probably the best way to start is to attend a Sunday service. (Click here for an idea of what you can expect.) Fill out the blue card in the pew rack and drop it in the offering basin or click here for a printable PDF version. You can also click here to contact our church office or interim rector. If you come to a Sunday morning service, be sure to stay afterward for coffee and donuts in our Great Hall. Just go through the east transept (front right) door in the sanctuary and follow the short hallway to your left. We have coffee, tea, juice, donuts, and lots of great conversation. You might even be asked to lunch! You can also click on any of the links in this website to get involved with a variety of activities. Click here for a brief introduction and here for a page of links and resources that can help you explore further. We also offer a seasonal foundations class to introduce newcomers to the distinctive aspects of our denomination. Contact the church office or the interim rector if you’re interested in such a class. Or just come visit and ask questions. We’ll be glad to tell you more! Pastoral care is provided by both lay and ordained ministers. If you or someone you love needs visitation, counseling, prayers for a special situation, or an appropriate referral to an agency or another church, please call the church office at 812-232-5165 or click here to contact either the office or our pastoral care team by email. We believe that prayer is dynamic. It changes things. More important, it changes us! Prayer requests may be sent to the rector at any time and, if desired, they will be shared in confidence with our prayer circle or with the congregation during the prayers of the people. Members of our prayer circle are pledged to confidentiality regarding all prayer requests they may receive. Click here to send a prayer request, and please specify whether you wish it to be kept completely confidential, shared with the prayer circle (also confidential), or shared with the congregation. That’s fabulous! 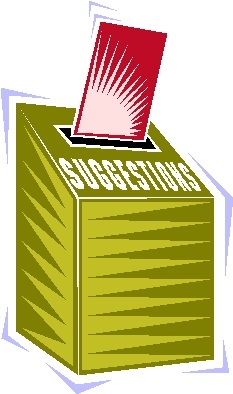 Click here to access our church suggestion box.